We’d love your help. 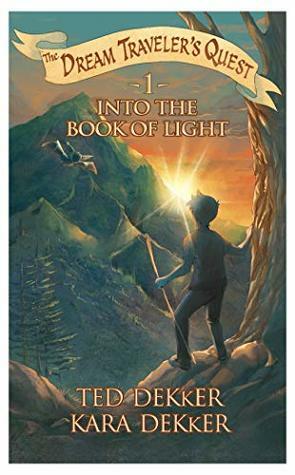 Let us know what’s wrong with this preview of Into the Book of Light by Ted Dekker. What if you could find a way to enter another reality full of wild and life changing adventure? And what if every time you fell asleep you woke up in that other reality? Welcome to the world of Theo Dunnery, a twelve year-old boy who feels alone and full of fear when he stumbles on an ancient book that draws him into another world. In that world, he learns he must complete a quest to find the Five Seals of Truth if he is to conquer his fears. Facing great odds and many enemies, Theo sets off on the adventure of a lifetime to discover who he really is as the son of Elyon, and overcome the darkness that has haunted him for so long. Join Theo on The Dream Traveler's Quest, one story told in four chapter books. Read all four and discover the truth for yourself. To ask other readers questions about Into the Book of Light, please sign up. As a huge Ted Dekker fan, I about jumped out of my chair when I received the first email promoting his new children’s series! And yes, I was one of the crazies that pre-ordered the entire series. That being said, as I read Into the Book of Light, I couldn’t help but feel a strong similarity to the Narnia series. It is a unique world with unique trials and quests. There are friendly creatures, and there are creatures that try to make Theo believe lies, but the ultimate quest is to figure out who h As a huge Ted Dekker fan, I about jumped out of my chair when I received the first email promoting his new children’s series! And yes, I was one of the crazies that pre-ordered the entire series. This book is geared for young readers, I’d say 8-12 years, so it is quick moving and simple to read. It’s clean, there is no cursing and no detail in the action scenes, and absolutely no sexual content at all. The illustrations really help the reader visualize the story and I thought they were incredibly well done. Overall, I enjoyed this beginning of Theo’s adventure and look forward to continuing his journey. And I also know that my younger siblings will enjoy this series! I give it 4 out of 5 stars! This is a children’s book set in the Circle universe. The theme of the book goes hand in hand (in hand?) with the message in The Forgotten Way and The 49th Mystic books. I got these books with the idea of sharing them with my boy, and I decided to read them to know when he’d be ready for them. I have to admit that starting this book, I didn’t get drawn in right away. Part of it is that this feels like the third time he’s written this story. It’s a good story, don’t get me wrong. And there are cl This is a children’s book set in the Circle universe. The theme of the book goes hand in hand (in hand?) with the message in The Forgotten Way and The 49th Mystic books. I got these books with the idea of sharing them with my boy, and I decided to read them to know when he’d be ready for them. I have to admit that starting this book, I didn’t get drawn in right away. Part of it is that this feels like the third time he’s written this story. It’s a good story, don’t get me wrong. And there are clear differences to Thomas’ and Rachelle’s stories. A really good allegory for a chapter readers. Theo needs to overcome his fears and learn the truth of who Elyon is and who he is. It depicts the journey well and the characters act believably. The Roush were fun and charming characters and I look forward to seeing more of them. Theo did agree to go on the quest a little too easily without questioning it which was a bit unbelievable. I look forward to sharing this book with my nephews and niece when they are able to read it. It was fun to get to know Theo Dunnery. The joy spilled from the pages when he met Elyon. And his newfound courage when he again met the Shataiki inspired me. This book was written for children, but it's a quick read people of all ages will enjoy. I look forward to reading the other three books in The Dream Traveler's Quest. This review has been hidden because it contains spoilers. To view it, click here. Having read The Circle series by Ted Dekker, it's exciting to see the world in a new light, and in a way I can share with my young children. The turmoil for young Theo is relevant and frightening. The transformation while meeting Elyon and the struggles that follow are real and breathtaking. Excuse me while I take a breath to start the second book! Enjoyable fantasy story for young readers. Even older readers might enjoy it. SO GOOD!! The story is so powerful and this series is a must read for all ages! Reading with my daughter! She is loving it and I’m excited to continue the series! Ted Dekker is known for novels that combine adrenaline-laced stories with unexpected plot twists, unforgettable characters, and incredible confrontations between good and evil. Ted lives in Austin with his wife LeeAnn and their four children.